And a link to a interview/profile about her at Clever Magazine. The interview is a few years old, but has some great information in it. I’ve actually come across a few travellers who’ve mentioned Vittoria on blogs after visiting Florence, which is great to see. I’d definitely buy another piece of hers without hesitation. Great to read about Vittoria here, her work really is amazing! Yes! One painting is not enough! I really love her stuff – thanks for the links – I’ll just pop over to Italy now 😉 (I wish). I enjoyed reading that interview of her while she is working hard on her paintings to sell in the streets. She really is a great artist. I purchased several of her pieces of art yesterday. Just barely caught her as she was packing up. One larger picture and 4 smaller ones. She was very kind to take the time to stop, unpack, and sell me her art. Now if I can only get them home safely. I felt the same, thankfully she was extremely helpful with packing and advice about transporting them home. In the end, I had to trim the mat board to fit it in the suitcase and worried about it half the flight home! Ashley I’m in tears and truly kicking myself for being a rookie traveler. Her art was lost along our travels because it was too big for the suitcase and we are devastated. Her art is too good to leave a chance of it being lost. Next time her art will have to be shipped. It was our true touch of Italy that we could take home with us and remember on our honeymoon. Nothing else could even come close to comparing to the beauty of her art. Hopefully we can reach her again. I say to everyone else to take the time and see Vittoria if you can. It is Italy brought to life in art. I wonder if a tourist centre in Florence would be able to contact her? 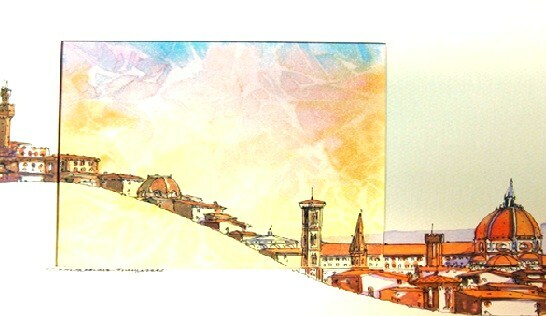 I bought a small watercolor when I was in Florence. I am so glad I was lucky enough to see her because I think she is so fantastic. My purse was stolen while I was there, or I would have bought much more from her. I just think she is brilliant. Hey Celeste, sorry to hear you had your purse stolen, that must have been utterly awful. I agree, she’s amazing – how many pieces did you buy? I ending up getting one large piece and three small ones, love em all! I came across Vittoria and her beautiful work while in Florence and could not resist purchasing a special piece to remind me of our time there. A treasure find! She’s amazing, isn’t she? I definitely couldn’t pass up the chance either! Sorry to hear that, Brian – terrible news! Was at the Palazzo Pitti the other day and passed by Vittoria’s work. I was there for a good 15 minutes or so deciding which ones to buy. They were all amazing and I wish I could have bought all of them! She was so helpful and nice when I was deciding which ones to buy. I know have 4 little beautiful reminders of my favorite city. Hi Amy, sorry about the delay in replying, but we had the same trouble! So many wonderful pieces to choose from. I absolutely love her style of painting. Does anyone know how to create the effect she does in the sky with the watercolour? I would love to try and recreate it! Does anyone know if she still is near Palazzo Pitti? I’m in Florence and really want to purchase some paintings from her!